RaySpec specialises in producing Silicon based energy dispersive x-ray detector systems for x-ray spectroscopy applications. All detectors are designed to deliver the highest specifications in energy resolution, peak to background ratio and throughput in addition to meeting our own exceptional standards of engineering quality. 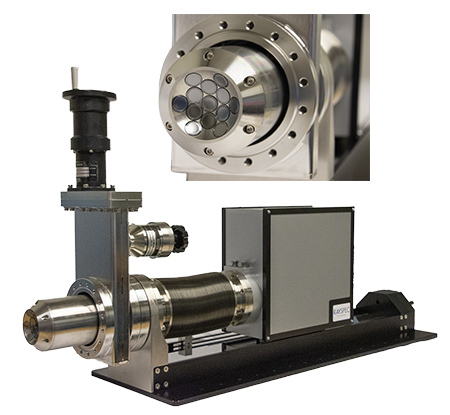 Our Silicon Drift Detectors (SDD) are available in many different formats, each designed for specific applications ranging from EDS (energy dispersive spectroscopy) analysis for electron microscopy through XRF (X-Ray Fluorescence) to special applications at beamline facilities. RaySpec EDS detectors are high quality, high performance products for EDS analysis on SEMs and TEMs. RaySpec XRF detectors are designed for all types of XRF instruments. They are available in a wide range of sensor sizes to meet all application needs. RaySpec manufactures high quality x-ray spectrometers for specialist beam-line applications using synchrotrons or charged particle accelerators. Detectors range from single sensor products through to complex, customised multi-sensor designs to suit all applications.